The sound of a sander intermittently interrupted the silence of the marina, but it was early during the week, so no one was around to be disturbed. Tony Shelton was hard at work preparing the bright-work on Ascension, a Pearson sailboat. There was much to do. The season was late getting started, and the summer was apparently going to be a short one. Tony is going to be making his second attempt south, down the Mississippi, for the winter. In the fall of 2016, Shelton provisioned his boat and headed toward the Cal-Sag on his way down the Mississippi. Unfortunately, he made it only to Starve Rock, in Illinois. He had a late start and ran into mechanical problems. As a sports and entertainment attorney, Tony chose to try a different path and live aboard his sailboat. His interest in sailing began while visiting islands in the caribbean many years ago. He sailed and raced the Chicago-Mackinaw Race a few times with Skipper Paul Thompson III (who was the first African America skipper to place in this prestigious 333 mile race) The idea of making the Caribbean his life's destination was very appealing. The warm weather and the laid-back atmosphere was a less hectic style of living. With a law degree and contacts in the Caribbean, he truly has options in making a living. The ultimate goal is to acquire a catamaran, which makes for a more comfortable living quarters in the islands. This fall Shelton will set out again, with the company of a nephew, down the Cal-Sag. He will exit at Mobile Bay, Alabama, onto New Orleans, Miami, visiting friends and relatives along the way. 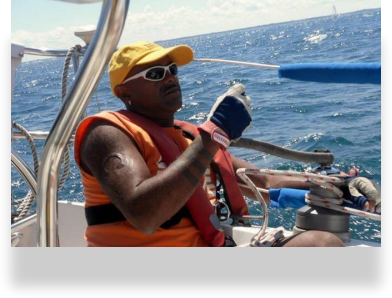 His ultimate destination is to sail to the Caribbean islands and perhaps Cuba (depending on the state of affairs), while along the way, assisting and working with people of the islands whose lives have been met with devastation from this past year's hurricanes. Shelton has chosen to live the frugal life aboard Ascension, which he describes as "the state of man's current situation; a spiritual journey, if you will".